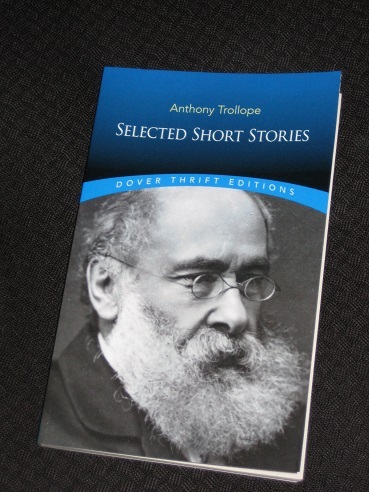 Anthony Trollope: Selected Short Stories, a book I stumbled upon while browsing online and immediately snapped up, is exactly what it sounds like. Trollope is far better known for his novels, but he did pump out a few shorter pieces, too, six of which are included in this Dover Thrift Editions release. First up, though, the bad news – two of these also appear in a book I posted on this time last year (Christmas at Thompson Hall & Other Christmas Stories). ‘The Mistletoe Bough’ is a slightly plodding piece with the inevitable happy ending, and ‘Not If I Know It’ is a rather brief tale about the importance of forgiveness during the festive season. However, the good news far outweighs the bad, with the remaining stories being the strongest choices, and the longest too (these four alone come to around 160 pages, which could have been 200 with a more generous font). Captain Broughton came to Oxney Combe, stayed there a fortnight, – the intended period for his projected visit having been fixed at three or four days – and then went on his way. He went his way back to his London haunts, the time of the year then being the close of the Easter holydays; but as he did so he told his aunt that he should assuredly return to her in the autumn. “I shall assuredly come,” the Captain had replied, and then he had gone on his journey. However, there’s many a slip twixt cup and lip, especially in the country (cf. the tragedy of Lily Dale and Adolphus Crosby), and the central premise behind the story is whether the Captain will indeed return, and what he will do if he does. It’s all interesting enough, but the story is marred a little by the insistence on some common Trollopian ideals. Should women have views of their own? Should they be expected to bend? And can they love more than once? All questions the modern reader may well answer rather differently to our hapless author. Similar themes are to be found in ‘Mary Gresley’. In this piece, a young woman (in the midst of a lengthy engagement) charms a group of elderly editors when she brings in her manuscript. The dazzled men agree to assist with her attempt to make a career for herself in writing, and the ambitious Mary sets herself a target of having a novel published before twelve months have elapsed. With genuine talent (and a fair amount of help from her good-natured admirers), there’s every chance of success – if only, that is, her weak fiancé wasn’t so set against her literary ambitions. Indeed he had told us his whole life, and what a picture of a life he had drawn! There was something in the letter which compelled attention. It was impossible to throw it, half read, into the waste-paper basket, and to think of it not at all. Intrigued by his plea, the editors decide to summon him, with the possibility of offering work of a complex nature to the poor scholar. After several interviews, including one with the writer of the text (and another with the publican who is McKenzie’s referee…), they cross their fingers and decide to trust him. However, the main event, and the reason I bought the collection in the first place, is the longest piece in the book – at eight chapters over sixty packed pages, it’s more a novella than a story. Best of all, ‘The Two Heroines of Plumplington’ has a rather familiar setting, taking the happy reader back to Barset for the only time outside the novels. Marriage is once again at the heart of the story, with the two heroines of the title determined to marry the man of their choice, in both cases against their father’s wishes. While the lively brewer’s daughter Polly Peppercorn is confident in her ability to wear down her brusque but loving father, Emily Greenmantle, the only child of the local bank manager is more doubtful. Still, with the local rector, Doctor Freeborn, on the side of the young ladies, there’s every chance of acceptance and reconciliation before Christmas arrives. I’m surprised the story isn’t available anywhere else (as far as I’m aware), as it’s guaranteed to appeal to Trollope readers (UPDATE – 26/12/17: As Jonathan has pointed out in his comment, the story is actually available in a recent Oxford World’s Classics edition of The Warden!). This is particularly true because of the familiar Barset setting. There are mentions of Silverbridge, Barchester Towers and the old Duke of Omnium, as well as a minor character called Harry Gresham, who (according to one source) might even be the son of Frank and Mary. There are even allusions to Hiram’s Hospital, another institution well known to Trollopians. The one great line of demarcation in the world was that which separated gentlemen from non-gentlemen. Mr. Greenmantle assured himself that he was a gentleman, acknowledged to be so by all the county. The old Duke of Omnium had customarily asked him to dine at his annual dinner at Gatherum Castle. He had been in the habit of staying occasionally at Greshambury, Mr. Gresham’s county seat, and Mr. Gresham had been quite willing to forward the match between Emily and his younger son. There could be no doubt that he was on the right side of the line of demarcation. He was therefore quite determined that his daughter should not marry the Cashier in his own bank. I’d probably be more interested in this volume than the novels as I generally prefer short stories and novellas over novels, especially long Victorian ones. Funnily enough The Warden is the only Trollope that I’ve read and the OUP version (9780199665440) included the story The Two Heroines of Plumplington which I liked even more than the main story. I should read some more Trollope though.